The Fisher Price Rock n' Play baby sleeper was recalled on April 12th, but Contact7 found a number of postings for the items on sites like Facebook Marketplace and Craigslist. 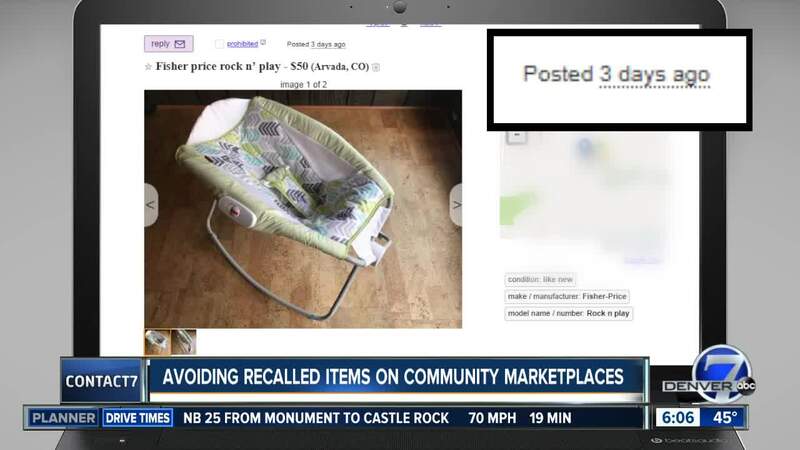 DENVER — A number of potentially dangerous infant sleepers are still being posted for sale on sites like Craigslist and Facebook Marketplace despite the product being recalled. The Fisher-Price Rock n' Play sleeper was recalled April 12, a week after advocacy groups began warning others about the product. A Consumer Reports investigation found more than 30 infant deaths associated with the sleeper in recent years. Individuals trying to sell used Rock n' Play sleepers online may be unaware that it is illegal to sell a recalled children's product. That's specified in the Consumer Product Safety Improvement Act of 2008 . Possible penalties include fines or jail time. In response to KMGH's requests for comment, Facebook sent a statement saying it uses technology and humans to monitor possible "policy violating" items on Marketplace. Craigslist did not respond to an email. Consumers should always be careful when buying or selling baby items online. There are so many recalls involving these items that thrift stores like Goodwill and Arc are not allowed to accept items that hold or carry a child. Consignment store Once Upon a Child says it does recall training and ensures products meet mandatory and voluntary safety standards. If you have a Fisher-Price Rock n' Play, you can get a refund or voucher by following the instructions on the Mattel website .